It's not every day that you see a blue mushroom. I thought at first I was having one of those flashbacks from the 1960s they said I'd have. I expected to hear Jimi Hendrix's version of All Along The Watchtower, or Jefferson Airplane's White Rabbit, and For What It's Worth by Buffalo Springfield. But all I heard was barking squirrels and mourning doves in the distance. I didn't say, "Where am I? How did I get here? And, What's that smell?" So I knew it wasn't a flashback. As it turns out, it was only just blue mushrooms. I'd never seen one of those before. Jilda asked if it could be those magic mushrooms. I had no idea because I'd never seen one before. When I G0ogled blue mushrooms, the closest I got was an Indigo milk cap though I wouldn't bet my life on it. So I just snapped a picture. But when I stepped into the office to write this blog, I did crank up the stereo and I have Jimi blaring through my speakers. I can tell you that they are not magic mushrooms. Never seen blue ones before. Good music choices. 50 years ago I would have fired that bad boy up and smoked it. Wow. They look intriguing but not edible or smokeable. Our magic mushrooms were also known as Gold Tops. And typically grew in cow manure. Anyway I changed servers and here I am. I have never seen a blue mushroom. I met a guy while hike the AT that was photographing and logging all the mushrooms along the way. Since then I have paid attention. Of course I still don't eat something I would pick, they skeer me for food. But I love the ones someone else has picked (or grown). This is really neat! I some red ones the other day that looked like tomatoes. You have the most interesting mushrooms growing around your place. I know they are not magic mushrooms because they grow in our cow pasture and we used to see people picking something at a distance and someone told us they were picking magic mushrooms in the autumn. Well, at least that "fungus among us" is sporting one of my favorite colors! I'll look in my yard and see if anything that cool is there! Very cool ~ like many of your other commentors, I've never seen a blue mushroom before. I feel like Alice - wonder if I eat one it will make me small/tall? If I were a mushroom, I would be blue because I like to be different . . . like blue roses. We have lots of mushrooms here in Oregon, people die often from eating poisonous ones, but I've yet to see blue ones. 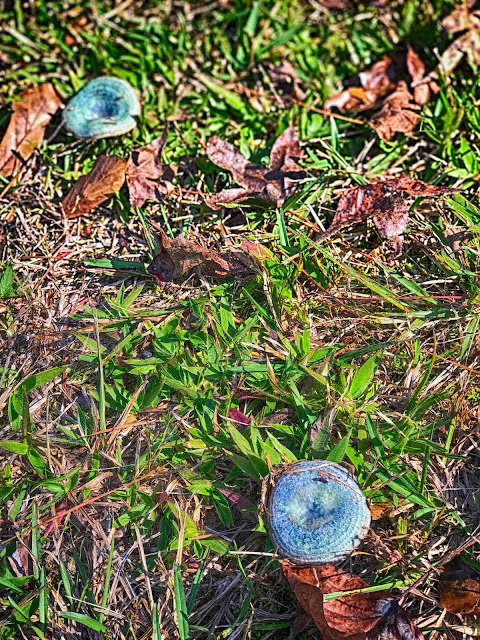 I wouldn't worry about (or eat) blue mushrooms, but if you see a plaid one, please let us know!! Interesting mushrooms. For What It's Worth is a particular favorite of mine.